First the Gobusters. Woo they have shades. Also their role call is "It's Morphin' Time" which I find is kind of nostalgic to those who watched Power Rangers. The mecha are called Megazords? Well I do have to admit I see a little bit of Zoids here which I am NOT a fan of. But still... nice designs. Apparently this "Messiah" (seriously he's not even one) is born from a virus. Somehow I am reminded of the Venjix Virus in RPM but this one is unique in its own way. It's too early to know what this being is capable of. I get reminded of Devil Z from Transformers Masterforce. What he's capable of doing still remains to be seen. What do I think? With Yasuko Kobayashi's talent, I guess she's definitely going to do it well. Why do I feel this show will be awesome? The Gokaigers face their biggest challenge ever which is against Ackdos Gill. Okay some people do consider him to be less thinking (and I am in that list) while Fantasy Leader counts him to be pretty competent. Views anyone? Actually the finale in itself is what I'd call a huge exchange of blows, well done CGIs which make it memorable. Okay I do dare to say that the Zangyacks are more on brute force reliant but that's what makes the choreography and sequences oh so great. He's pretty insane IMO, taking the whole armada and all. 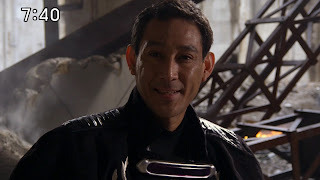 Actually some of my favorite Sentai villains are insane but he's not as cool as Basco. But still, cool finale! Well Gokaiger's coming to an end and I kinda want to see the action conclusion. So here's what's been going on. One has to admire what happened. The Gokaigers see what real treasure is- their friendship with the various Super Sentai heroes. So moral here is that your friends are more important than all the treasure in the world. The decision was to actually destroy the Ultimate Treasure. Woohoo! What a selfless decision! 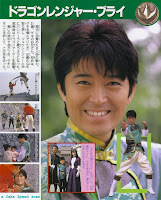 Just some belated Zyuranger action, one can't help but remember Geki getting his late brother Burai's armor and Zyusouken. On the other hand, one has to brace through the destruction of Akudosu Gill. Well this is just an idea that Chris X gave me from this blog entry based on a Zyuranger pairing talk. Now it's time to explore what could get SUPER CRACK! For all Power Rangers fans who are new to the original work of Super Sentai and enjoying it, beware NEVER to do these pairings!